When your kids are really young, they’ll inadvertently tell you about every single bump, bruise and boo-boo. When they get a little older, all you have to do is tuck them into bed and, as if they’ve been administered truth serum, all of the day’s confusions seep out of their mouths. But by the time they get to their tweens or teens, single syllable answers like “fine” and “OK” can easily replace the nuanced details they used to share about the day’s interpersonal dealings. So how’s a parent to keep the lines of communications open when their kids start shutting them down? 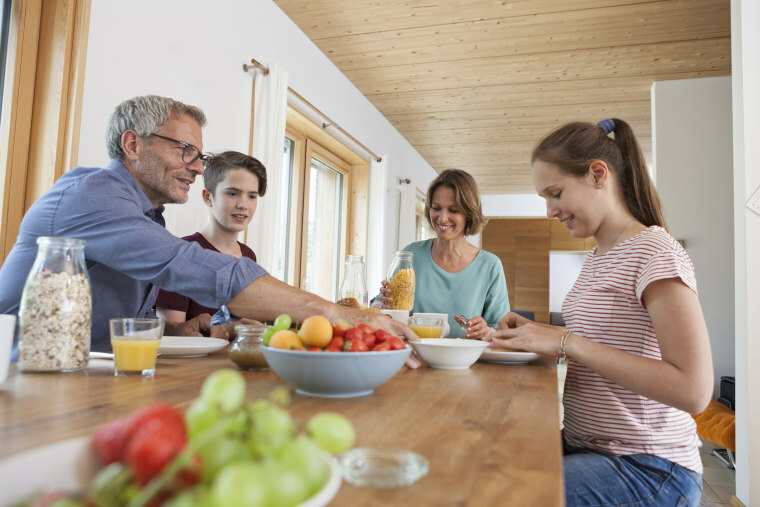 It’s much easier to keep the lines of communication open with your child if open communication has always been big in your home, Srebnick says. Besides, the way kids are wired supports this kind of learned behavior. “The neurons in various brain areas connect with synapses, which are pruned into adulthood,” says Jensen. “They start with a lot of brain cells and, their experiences (doing something through repetition) strengthen the synapse. This is why children can learn things faster than adults. Adolescents are learning machines. The more they use their brains, the stronger the connections get,” she explains. “Text, Snapchat are great ways to have a quick catch up with your kids and even talk about sensitive topics they may not feel comfortable talking to you about in person,” suggests Yalda T. Uhls, child psychologist, author of Media Moms & Digital Dads, and UCLA Adjunct Professor. That’s because strong emotional reactions are, quite simply, part of the adolescent brain make-up. “By the teenaged years, the limbic system — the emotional center — is lit up, even in an MRI,” explains Jensen. “Their emotions are in technicolor and it activates their urge to take risks. It’s good for parents to know this is to be expected. Don’t make fun of them for overreacting. If you were to look at your child’s brain, it’s as if they actually feel an international incident is happening,” she says. And to have someone tell you it’s going to get better doesn’t really help, says Srebnick, who suggests, take a Zen “rock in the river” approach by acknowledging them and offering support without trying to project any outcomes, point out their role in their situation, or fix things. If your kid has something to confess, or something a little more serious than the everyday social scuffles, what your child needs most is an advocate. Srebnick recommends entering this kind of dialogue openly, by asking questions, to keep the conversation flowing. “They already feel bad and scared. Ask questions, but not loaded questions, about what they’re feeling, not what they did. Create a world of acceptance for them as a person, not what they did,” he says. If you’re feeling a disconnect with your kid, Srebnick says a road trip can do wonders to get them chatting. “If confined to a car, at some point, your child will talk to you,” he says. He also advises to make these little sojourns a regular occurrence when things are fine, not just in those moments when your kid is stressed or heartbroken. Occasionally, a normally clammed-up kid might feel compelled to let their emotions loose with an outburst, but Srebnick says this doesn’t necessarily mean your kid is going through an awful time. “Sometimes, something happens or something is activated in our tweens and teens where they really need to talk and the levee just breaks,” explains Srebnick. “If you talk to any preteen or teen, they feel so good when they’re good, and so bad when they're bad. It’s hard for them to self-regulate and find lukewarm water.” Just be warned this might not be the new normal and your kid might resume their typical reserve, and that’s OK, too.